Teotihuacán is located twenty miles north of México City. The ancient city is unique in that it appears to have been master-planned by an extremely powerful centralized elite from its very beginnings sometime around the first century A.D. Yet there is little evidence to suggest who its rulers and administrators might have been. Click on Image for more detail. Unlike their contemporaries, the Zapotecs of Oaxaca and the Maya of Central America; Teotihuacanos apparently cared little for documenting their history in writing, choosing to ornament their temple and palace walls with enigmatic images of powerful spirit forces and gods, ominous patrons of rain, agriculture, and war. The ancient city featured two of the largest man-made architectural wonders in the Americas, the Pyramid of the Sun and the Pyramid of the Moon, so-called by later Aztecs who believed that their world was literally created from the ancient ruins through the self-sacrifice of their gods. 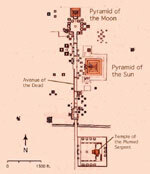 The pyramids were aligned along the main axis of the ceremonial center, a four kilometer long processional called the Avenue of the Dead that joined the central ceremonial precinct with the Ciudadela or Citadel, home to the ranking elite. Teotihuacanos excelled at stone carving, creating statuary weighing in excess of 200 metric tons, but perhaps their most enduring artistic legacy has been the scores of radiant fresco murals that continue to be uncovered year after year in excavation. The Pyramid of the Sun is nearly 650 feet on each side and rises over 200 feet high. It was constructed in a single explosive burst of construction activity possibly as early as A.D. 150. Click on Image for more detail. The Avenue of the Dead terminates at the foot of the Pyramid of the Moon, a religious structure clearly modeled on the towering mountain, Cerro Gordo, that rises in the distance. Click on Image for more detail. The Temple of the Plumed Serpent was a focus of ritual activity at the Citadel. The tenoned heads ornamenting its facades alternate with representations of lightning and water serpents. Click on Image for more detail. A 22 ton sculpture of a water goddess was excavated in the plaza before the Pyramid of the Moon. The stark geometric style epitomizes Teotihuacán stone carving. Click on Image for more detail. A bowl ornamented in fresco style paint displays an image of the Teotihuacán rain deity known to the later Aztecs as Tlaloc. He is identified by the goggles around the eyes and the fanged teeth. Click on Image for more detail.